Can the city ever fix its $7 million general fund rift? You can see the effects of Spokane’s persistent budget hole in many places, but none is so visceral as trudging carefully past the cat turds out behind the maintenance garage. “We get a hell of a lot of feral cats out here. And marmots, too. It’s interesting to watch the antics at night — it’s almost like the Hatfi elds and the McCoys,” our guide says, crunching through gravel to the burnt-out remains of a Crown Victoria police cruiser, incinerated in a grass fire sparked by its own exhaust several years ago. “You can see how hot this burned — there is melting on the bars of the cage. But it’s still usable,” says Paul Van Sickle, analyst for Spokane’s Fleet Services Department. 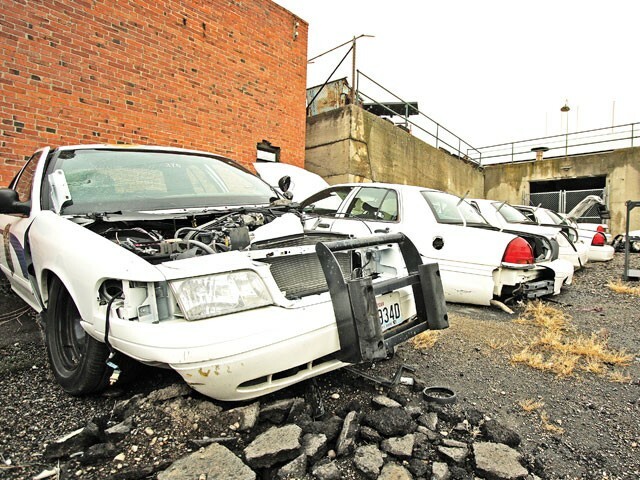 The car rests among a collection of old police cruisers — one is 16 years old — that provide valuable spare parts for the city’s fleet. This boneyard, as it’s known, has become all the more valuable in recent years. Thanks to the “persistent structural gap” in the general fund (which largely covers police and fi re), the city skimped in 2005 and 2006 on its annual, roughly $500,000, purchase of 25 new police cars in order to help stitch up the hole in the budget. “We have permanently aged the fleet,” Fleet Services Director Gene Jakubczak told a room full of officials at last week’s meeting of the City Council’s public safety committee. Skipping those two years has pushed the average mileage on the 175 police cruisers to 120,000. “We will never catch up,” Jakubczak adds. This is the dilemma the city faces as it prepares to pass a $618 million budget by the end of the year: Cuts, even “temporary” cuts, can have long-lasting impacts. Also, this is what the city largely has done during a decade of general fund gaps: squeeze expenses, lay off workers and hope that strains on infrastructure don’t get too dire. What about the other side of the equation? Can’t the city raise taxes or fees? An initiative by Police Chief Anne Kirkpatrick to institute neighborhood policing was hailed as a way to heal the rift between citizens and a police force wracked by the in-custody death of Otto Zehm and a cornucopia of high-profile scandals. But instead of hiring extra police for neighborhood beats, the department is back to bare bones. The fi re department has fewer fi refi ghters riding older rigs to more service calls in a growing city. Still, there is little proposed in the way of revenue hikes. The city is increasing its base business licensing fee from $60 to $110, but the increase is the first in 11 years — and the city has made it more palatable by not increasing an associated fee per employee. Spokane also will remain one of the rare cities that does not levy a business and occupation tax. Strikingly, the other major city that ignores this revenue source is Vancouver — like Spokane, a border city. And that’s the argument you hear from many local offi cials — from Mayor Mary Verner to Eastern Washington University assistant professor of economics Grant Forsyth to Councilmanelect Jon Snyder. The city, they say, needs to carefully calibrate its taxes so as not to drive business across the state line. Budget squeezes that kill initiatives such as neighborhood policing frustrate Councilwoman-elect Amber Waldref, who sees three main areas to explore for permanent balancing of the general fund. 1) Combine services such as parks, animal control or even fi re departments with other entities throughout the county. 2) New methods to pay for streets. Mechanisms such as transportation benefi t districts and street utility taxes are already being discussed. 3) Increase the city’s tax base by making Spokane attractive enough to recruit “sustainable jobs… that are going to stick around and be good paying,” she says. City Councilman Richard Rush is also taking aim at the gap. “I have drafted an amendment to the effect that we ask the Legislature to allow cities more progressive revenue sources and simultaneously alleviate the regressive utility and sales taxes that are not so equitable to lowincome residents,” he says. Rush also says it could be worth a push to ask the Legislature to repeal Tim Eyman initiatives 695 ($30 license tabs) and 747 (one-percent property tax cap, down from 6 percent). The initiatives were found unconstitutional by the state Supreme Court but large portions were left in place by Legislature. Relatively robust wages may be true for police and fi re, but Mayor Verner has a chart showing typical workers in Local 270, the city’s largest union with 1,000 members, are in line or below private-sector pay. A city electrician, for instance, makes about $21 an hour while the private sector makes $25 to $34 an hour, according to Department of Labor and Industries fi gures. The city’s projecting another multi-million dollar gap for 2011 and may have to negotiate with the unions again. With people — through their salaries and benefits — making up 80 percent of general fund expenditures, it seems counterproductive to keep squeezing. Eventually there will be an inescapable loss of service. “Now the next level of cuts will start biting into services unless we’re creative about it through concepts like regionalization,” Mayor Verner says.